Notes: While there is no American license for this show, it does have a license in French, German, Italian, Spanish, and Dutch and may have run in the respective countries' TV channels at some point. Katri, like a great number of other shows, is a TV show based on western literature counted among the "World Masterpiece Theater" titles. 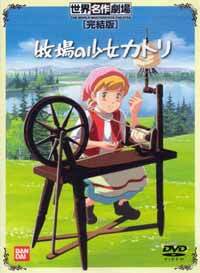 It's based on the Finnish novel "Paimen, piika ja emäntä" by Auni Nuolivaara. When Katri was six years old, her mother had to leave for Germany to find work. She left her daughter a small puppy to keep her company while she continued living with her grandparents. Three years later, the war was in full march, and Katri, now nine years of age, has still to hear from her mother. What's worse, due to the poor harvest and her grandparents' cow being taken by a bear, they are about to fall on hard times. To ease her grandparents' burden, she takes on work on a farm some ways from home, with Apeli -- her now somewhat grown dachshound -- following along. Which is not to say that you should underestimate it, though. 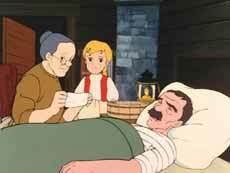 It doesn't take the show long to delve into various social-political topics, like social classes or politics or the fact that, at the time this show was taking place, Finland would find itself under the rule of the Soviet Union. 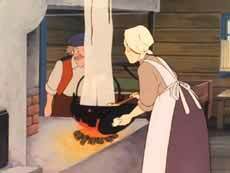 Katri herself, like so many heroines of novelisations and old folk tales before her, is a member of the lower caste. Her grandparents are generally poor, and with her mother having to go abroad just to keep them financially afloat, Katri is the very symbol of the honest, straightforward working class people living in a time when education wasn't readily available for anyone who wanted it, much less so if you couldn't pay for it. Katri herself does wish she could have gone to school, but realizes that she could probably never afford it. Which is a shame, because during the show, some people does notice that she's actually a very sharp girl. Her keen mind mostly showing through her love for reading, particularly through a very famous Finnish written work by the name of Kalevala. Her closest friend Martti, who is a member of the social elite and does have the opportunity to go to school, is less enthused about the idea. He recognizes her talents regardless, but perhaps more importantly, doesn't see anything wrong in associating with someone considered lower class citizens. In fact, few of the people in Katri, Girl of the Meadows do. 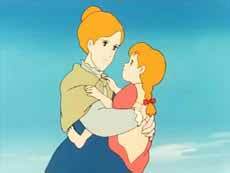 I once said about Nausicaä in the Ghibli movie of the same name that her mostly perfect nature made her somewhat insufferable at times. The same could probably be said about Katri, but to a lesser degree. She's smart, she's hard working and she's somehow able to get in almost everybody's good graces with little effort. 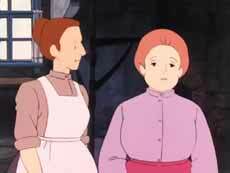 That being said, she's got more in common with Gerda from Snow Queen rather than Nausicaä, or perhaps even Kiki from Kiki's Delivery Service. She's occasionally put in moral dilemmas where any choice she makes has the potential for disasters, and the end results doesn't always come without its share of pain. Nor does she always have the answer to everything, which is only natural. She's only nine years old, after all. The rest of the cast are equally colorful in their own right. Katri's grandparents are fully devoted to her, as they should, and were initially very much against Katri having to find work. The Räikkölä -- the family Katri ends up working for -- come across as a bit odd at first. The wife of the household had lost her own daughter when she was Katri's age, and her grief eventually made her a little odd. This weighed heavily upon her husband, a generally good man at his wit's end. 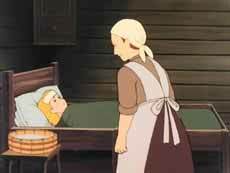 They all mellow out a lot, though, as Katri and her dog takes some of their work off their shoulders, and even more so seeing how Katri's presence eventually helps Mrs. Räikkölä overcomes her grief and become her old self again. 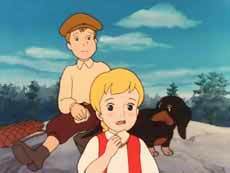 Even Martti's parents and relatives seems not to mind Katri mingling with their son of the social elite, although they generally don't get all that much screentime either, except possibly Martti's jealous and spiteful cousin, Helena. Her attitude probably doesn't have as much to do with Martti hanging out with someone of a lower class than Martti hanging out with someone who isn't her. A little later, they also meet up with Aki, an artist who later is revealed to be a member of a political faction who works for the sake of bringing literature and education to everyone, and with that, independence. This is where Katri, Girl of the Meadows takes on a political bent. Sadly, this also happened in the last of the episodes I had, so I can't really say how deeply the show delves into this very subject. If I learned anything by what I read in my childhood, then that would be that happy endings weren't always a given, and even the journey to said endings might be filled with all kinds of stuff I think people would consider unsuitable for children today. That said, Katri, Girl of the Meadows remains a fairly lighthearted show for the most part, with the occasional moment in scenes designed to make you think, if just a little. If I ever get a hold of more episodes of this show -- and I hope I do -- I'll keep you posted on the goings-on of the Finnish countryside caught up in a revolution, not necessarily of weapons and warfare, but information and a wealth of choices for the younger generation to choose from. 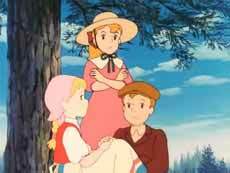 It's also entirely possible that the show remains a single story about a little girl waiting for her mother while doing her best to help her grandparents by showing her audience what it means to be a farmer stagehand at a time when farming and livestock was one of the most important things around. Either way, Katri, Girl of the Meadows is a little ray of sunshine among the scattered, grey-speckled clouds, and I easily recommend anyone up for some slow-paced slice-of-life drama to bask in those rays if the chance presents itself. 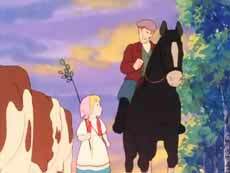 A scene that made me cringe, though, is when Mr. Räikkölä punished Katri for leaving the cows unattended -- well, almost unattended -- where they ended up going over a hill and almost drowning at a mud-covered slope going into a lake. This he did by taking a wooden branch and giving her a single whip-like strike. Given that the show is basically taking place where this sort of punishment used to be pretty commonplace, I can only assume that he did this with the intention of hurting her and not harming her, but it's still not an easy thing to see.